When I was in grad school I made a lot of artwork using paper I made myself. I was describing the work and the process of papermaking to a friend, and she looked puzzled and said, "You know, Molly, you can buy paper now." I get the same reaction about handweaving sometimes--why would you ever spend all the time and effort it takes to weave cloth and make garments by hand when you can buy these things so readily and cheaply? 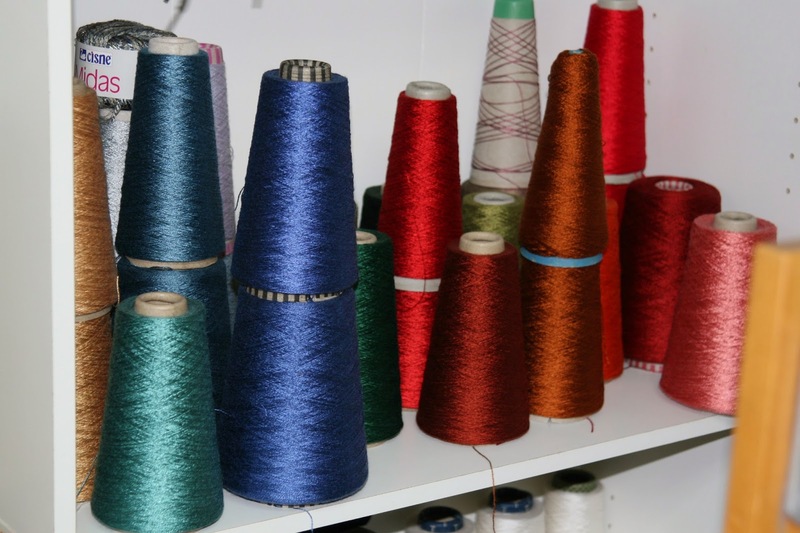 Beautiful fabrics abound and "fast fashion" is so inexpensive as to be disposable. Why weave? Is it merely a harmless and rather peculiar hobby like, oh, building scale models of the Eiffel Tower out of toothpicks? And why buy handwovens? Why pay $75 or $95 for a scarf when you can snag one for $12 at Target? 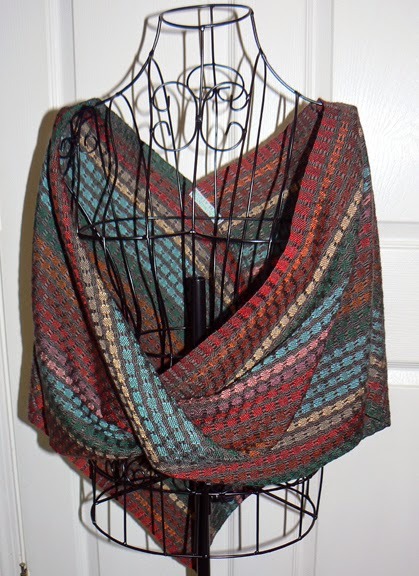 I thought one answer might be found in looking at the process of making a handwoven item from start to finish. How do I get from here. . . . Here I'm winding the warp for this project, an infinity wrap ordered by a friend. This warp will be about 5 3/4 yards long (enough for two wraps) and 348 threads wide. 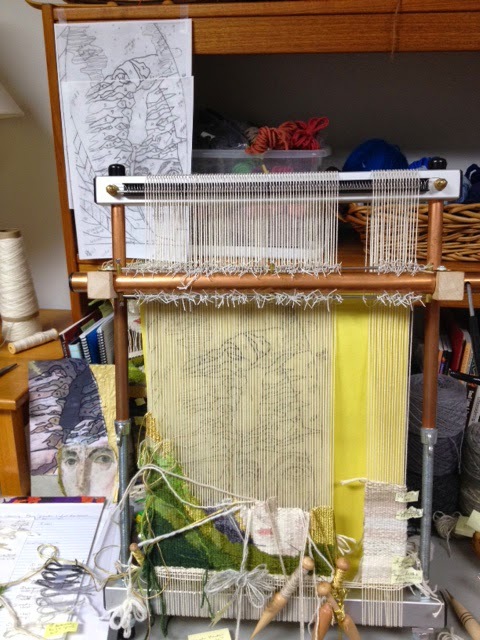 The warping board allows me to easily measure and keep in order all this thread. Fun fact: One scarf contains 1500-2000 yards of thread--about a mile, more or less, every inch of which passes through my fingers twice before I'm done. 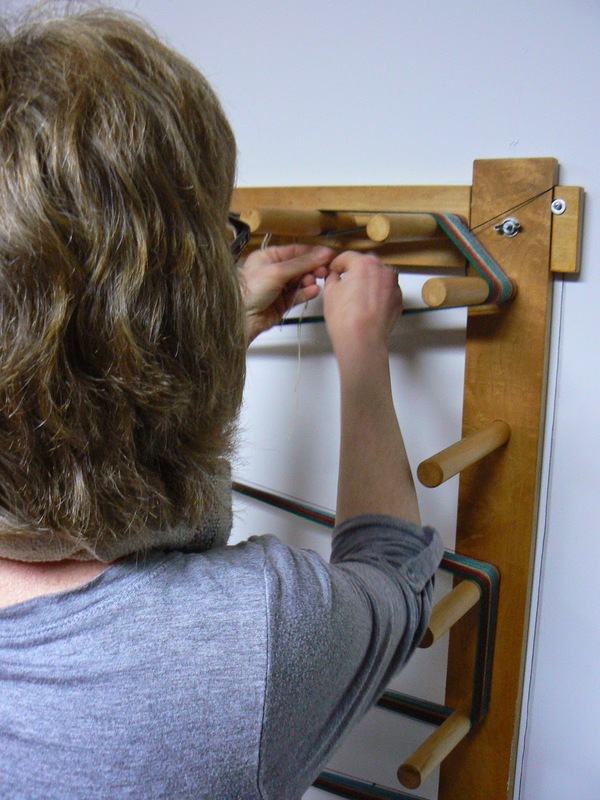 Before I can remove these measured threads from the warping board I have to tie them in several strategic places to keep the threads in order and keep them from tangling. Then I form them into "chains" (like chain stitch in crochet, using my hand as the hook), to make them short enough to move around easily. 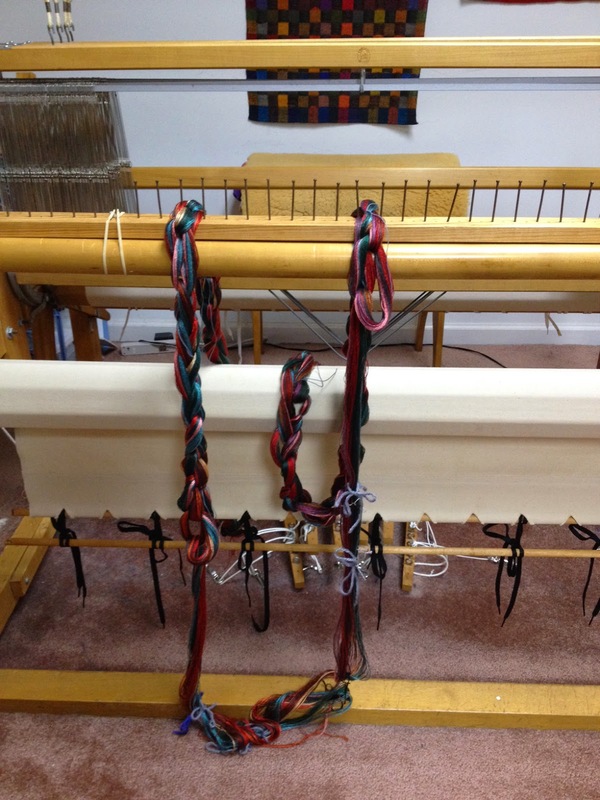 Here are two warp chains already wound and draped over the back of the loom, waiting for the last warp chain to be finished, so they can all be "beamed" or rolled onto the warp beam of the loom. 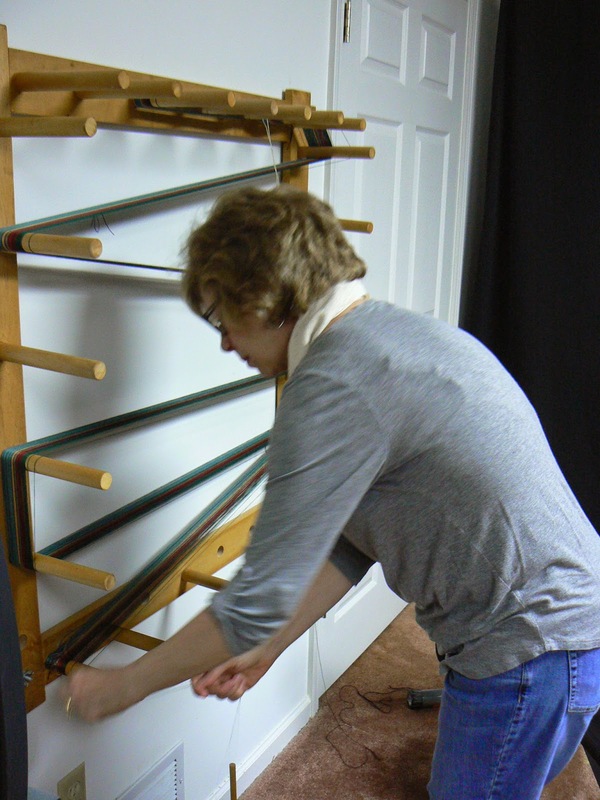 (The warp beam is wrapped in white canvas and tied to the apron rod with black shoestrings.) The chains are resting for now between the nails of the raddle, that long piece of wood rubber-banded to the back beam, with the nails spaced 1" apart. The warp was wound in one inch sections, so I can easily distribute the full width of the warp evenly all the way across. The next step is to position the warp chains in some temporary tools that allow me to get the warp onto the beam with minimal tangling, swearing and tears. Below you can see how I've spaced the warp across the raddle in one inch sections. You can see me holding two long lease sticks, positioned so as to keep the threading cross (never mind) in place. 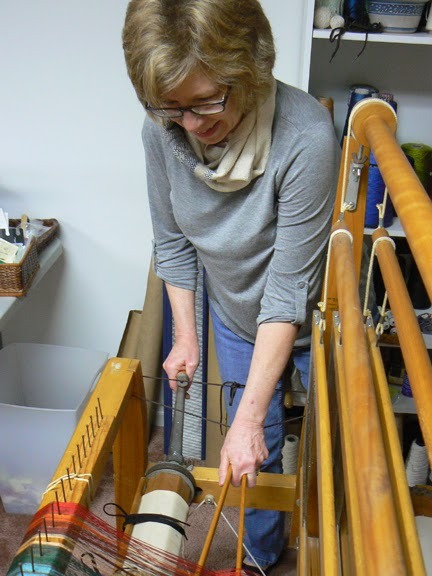 Then comes the winding: a process of standing in front of the loom, shaking and strumming the warp threads to encourage them to lay parallel to each other, and then tugging them all to put tension on them. 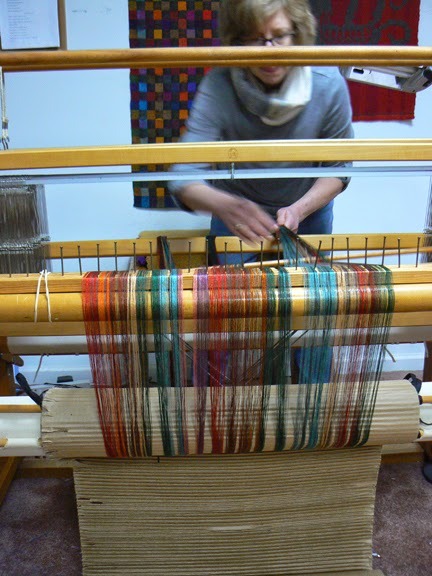 Then I wind the warp onto the beam using a handle. I alternate shaking and strumming the threads, and turning the warp beam, several times, proceeding about a yard at a time, until nearly all the warp is wound on the beam. I've inserted a roll of cardboard that winds on between the layers of warp thread on the beam, again to keep them from tangling and to keep the tension consistent. No matter what the fiber technique, it always comes down to controlling tension, doesn't it? In the thread as well as the maker! Next comes threading. A task for another day. . . . Lately I've been preparing to teaching a class on the design process at the Southeast Fiber Forum conference at Arrowmont School of Arts and Crafts. I put together a slide show of several of my artworks, along with their inspirations and the samples or models I made while working on each piece. It was really interesting to look back at my work in this way and to realize that like everyone I return to the same sources of inspiration and ways of working over and over again. 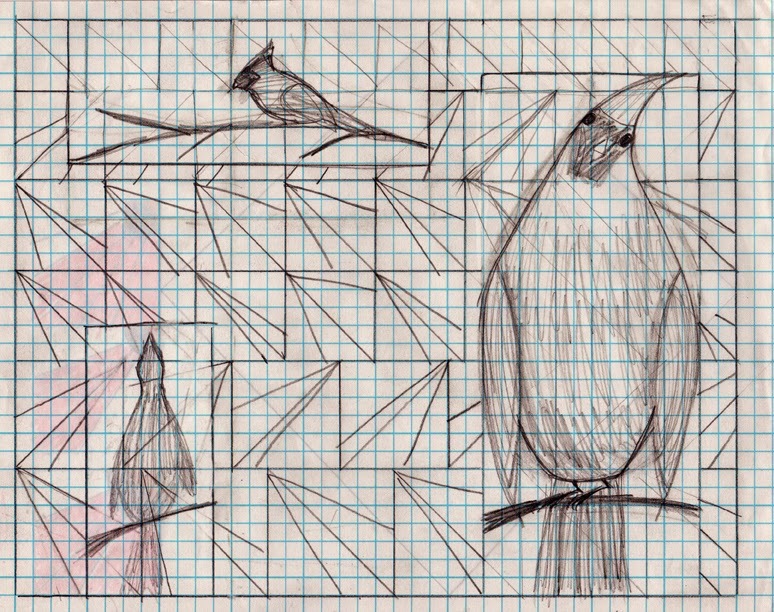 You can see these early ideas were all over the place, from semi-realistic to completely abstract, and they were hardly resolved, in some cases quite crude (I'm lookin' at you, triangle bird!) I find that the hard thing at this stage is to keep faith and remain patient with yourself as the ideas do develop and resolve. The last two examples are very close to the actual block I used, a diamond-shaped block that tessellated with background blocks in the same shape. I decided that despite their drab coloring the female cardinals deserved to be seen too so I included them as well. Often it's the duller, quieter colors in a piece that allow the brighter colors to really sing. 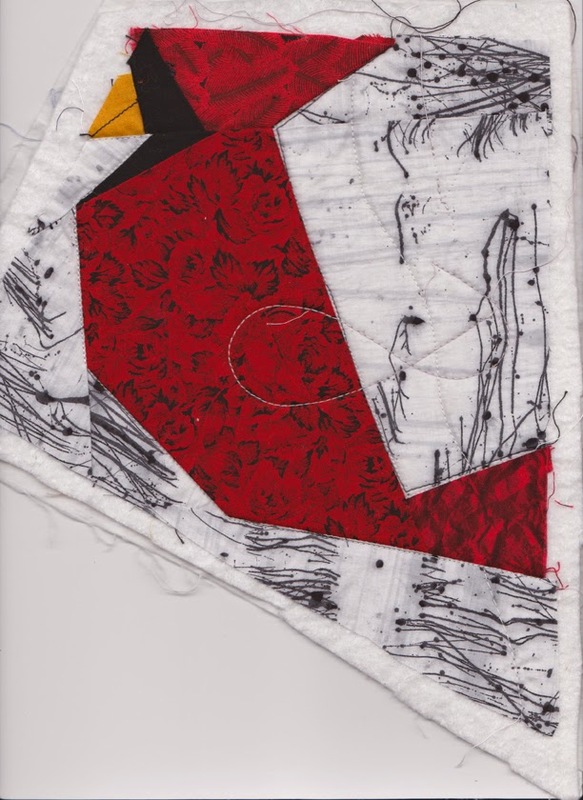 I added a wing that is a faced flap that stands out from the block, an idea I borrowed from the amazing quilt artist Ruth McDowell. To add interest some of the background blocks are pieced in strips, and the quilt's border is irregular and interrupted in places by the blocks themselves. Of course, you know what they say about the best-laid plans. In this case, after I had all the blocks pieced together and had done the quilting--when the quilt was nearly finished, in other words--I added the large branch shapes, appliqueing them over the surface of the quilt. It seemed that the birds perched on their tiny twigs needed to be connected to larger branches somehow. Not all the birds are on a branch, but enough are. 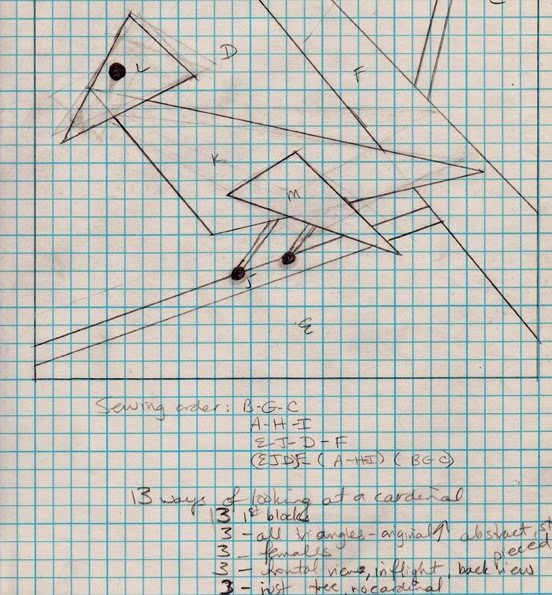 The birds are no longer floating in space, and the branches lead the eye through the piece effectively. And I like the disconnectedness of the branches, which would never have happened if I had designed them in from the beginning. So it seems that both deliberate planning and then being able to respond sensitively to the piece in front of you as it develops are both crucial. Hmmm. This is one of those lessons I seem to learn anew with almost every piece I do. 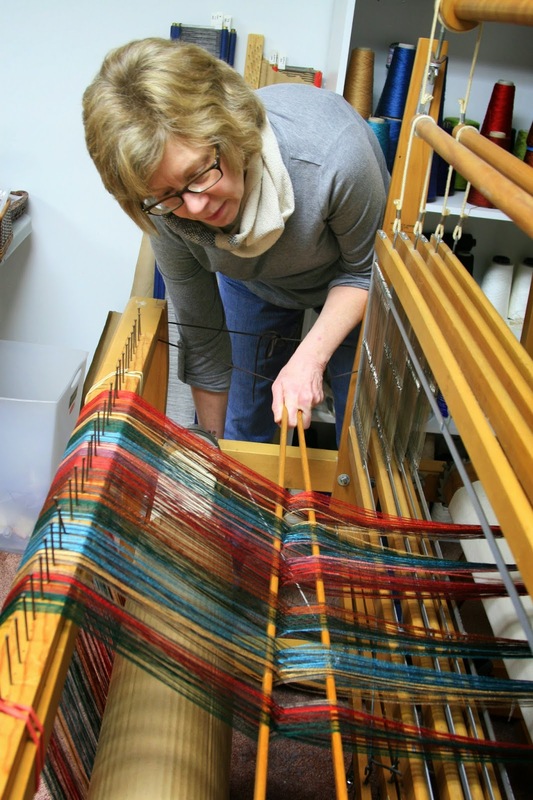 There are still some spots available in my class at Fiber Forum, April 16-19, 2015. Email me for more information, or go here. 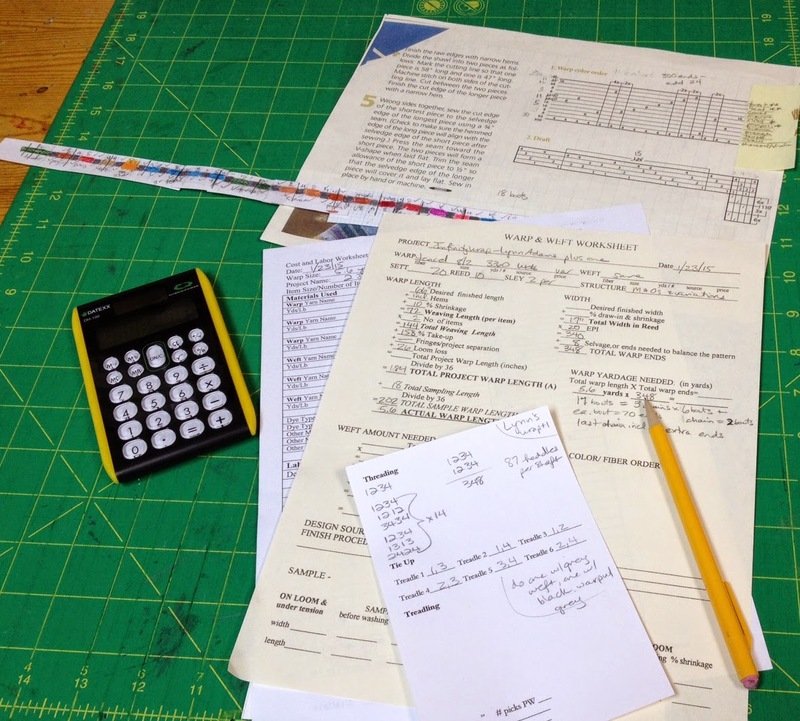 My last few posts have been long and wordy. . .today I'm just going to share a few photos of what I'm working on. And maybe a few words of explanation. This is a shawl in off-white alpaca-silk. This yarn is super-soft and I'm weaving a diamond pattern in it. 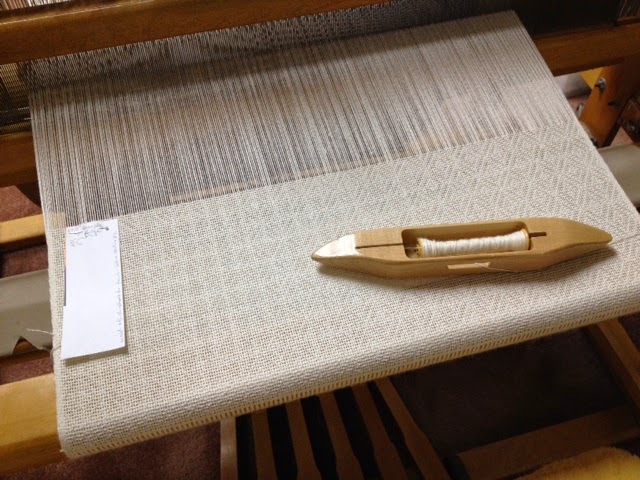 Usually I make my warps (the long threads strung under tension on the loom) long enough for at least two projects. I challenge myself to make the second project significantly different from the first, by using a different weft yarn (the yarn that goes horizontally across, carried in the shuttle you see resting on the fabric), or by varying the woven pattern somehow. 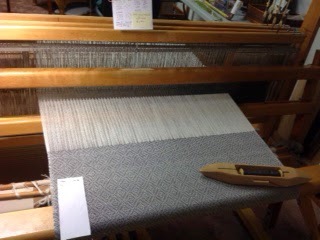 The second piece on this warp is above--using a dark grey weft, also alpaca-silk, in the same diamond pattern. Why diamonds? 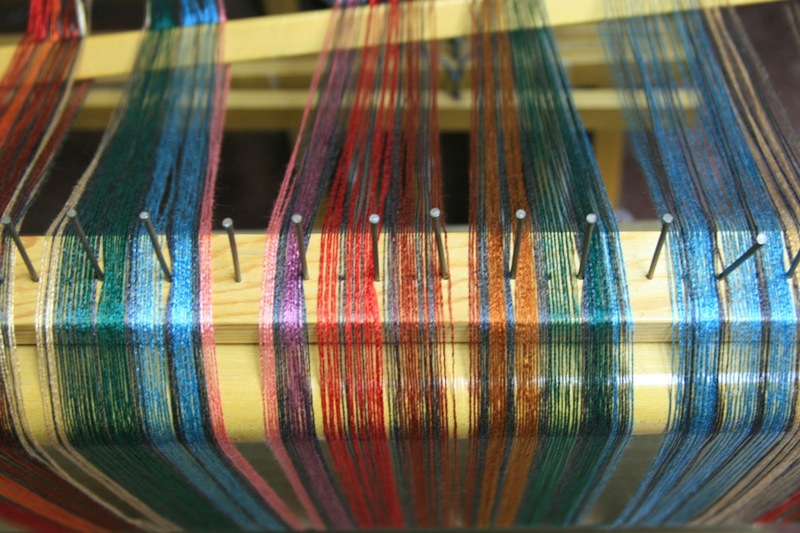 The Chattahoochee Handweavers Guild, where I learned to weave six years ago, is celebrating their 60th anniversary soon and throwing a party at which members are invited to show off a diamond-themed item they have woven. 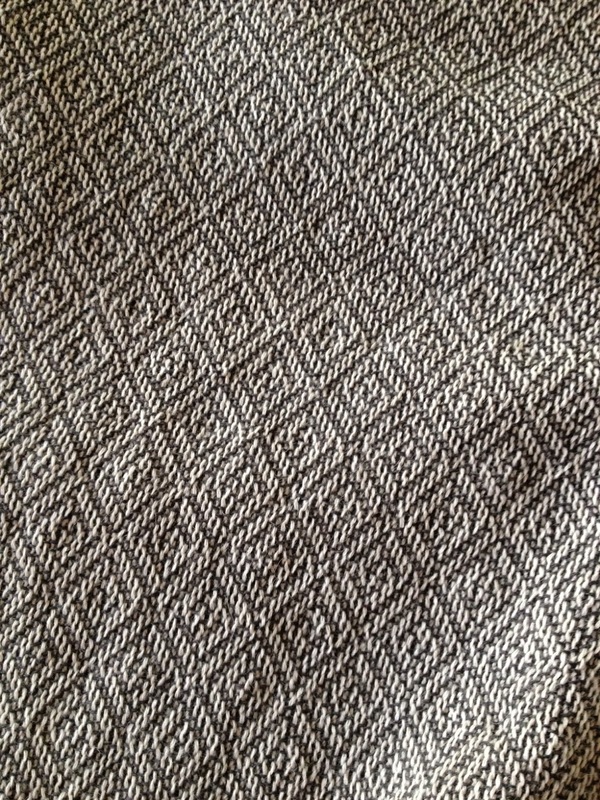 You can see the pattern better in this detail shot below, taken after the fabric was washed. Fingers crossed that one of these pieces will be fit for public display! When I'm not working at the floor loom I'm stealing time for tapestry weaving. Below is the next one in my series about the Virgin Mary. I took this photo last week. 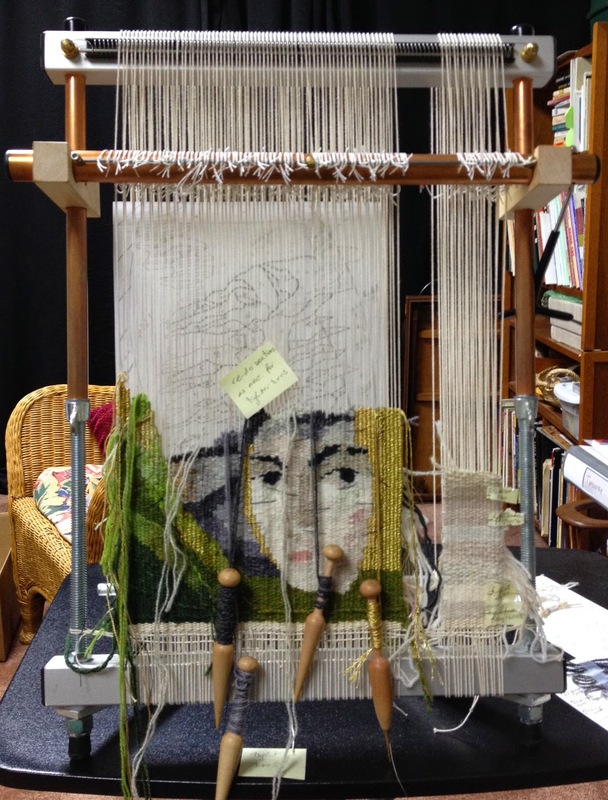 As you can see I'd barely woven any of Mary's face, since for technical reasons I had to start with the green area on the left. Here's hoping your own creative efforts--whatever your medium--this week have been rewarding. Onward! P.S. If you enjoy what you're reading, please click on the button under my photo at the top right to subscribe to this blog. And as always, your comments are welcome below. I do have to approve them, to prevent a few bad apples from spoiling the discussion for everyone, but so far I've published every comment I've received. 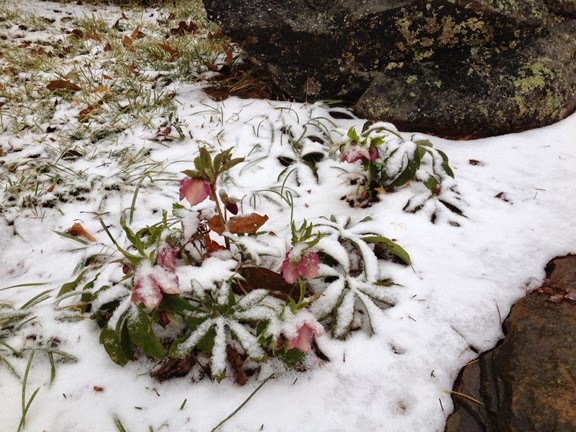 When you hear the word Quilt, what do you think of? 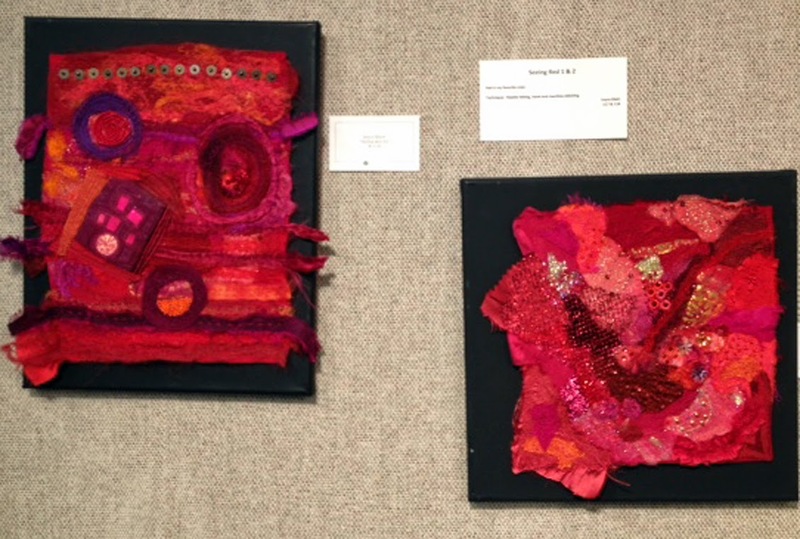 If a warm bed-covering is the only thing that comes to mind, get thee post-haste to the Cherokee Arts Center, where Executive Director Mary Akers has assembled a group show "Fiber Arts and More," that showcases the range of techniques used by local art quilters today. But you have to hurry--it's only up through Feb. 12. 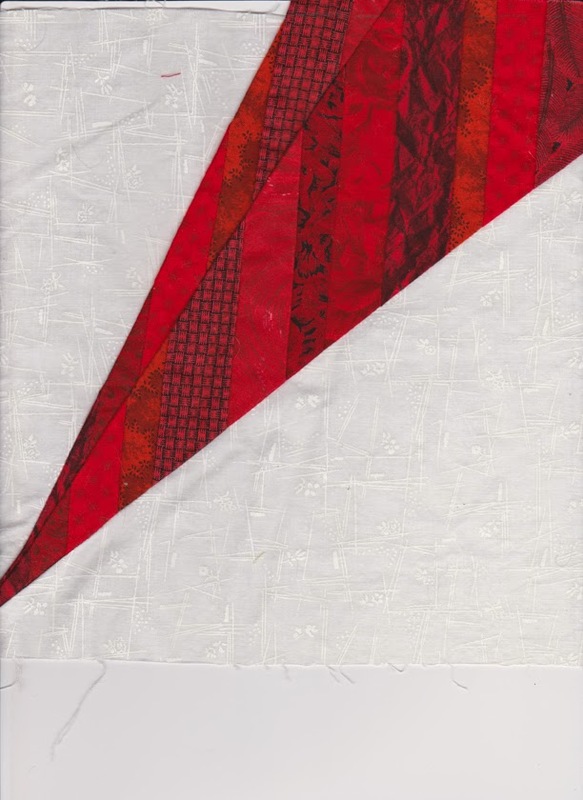 If you are wondering, "What is an art quilt?" listen up, and then look at the photos below. 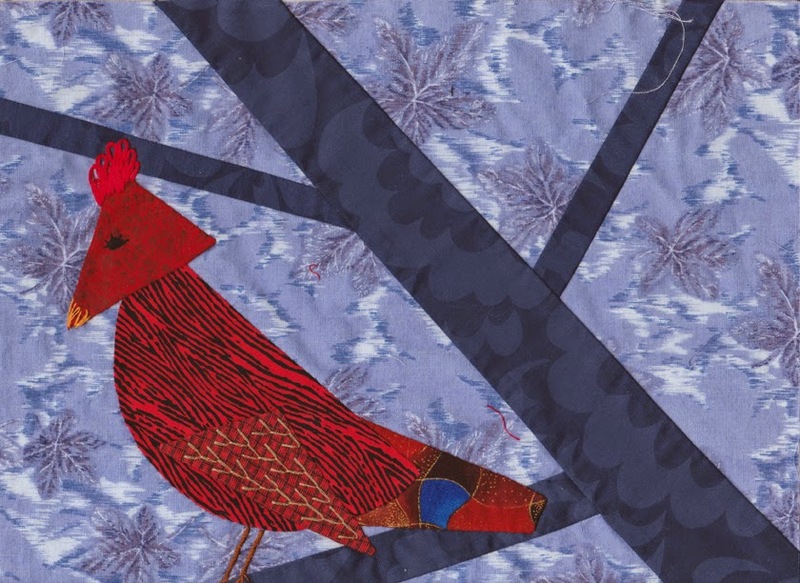 In the 1970s, quilting underwent a resurgence that coincided with the nation's Bicentennial, the women's movement, and a wider revival of studio craft. In 1971 the Whitney Museum in New York City mounted a hugely influential show called Abstract Design in American Quilts. The quilts were hung on the wall and their vivid geometric patterns could be seen afresh, in the context of other recent art movements such as abstraction and color field work. 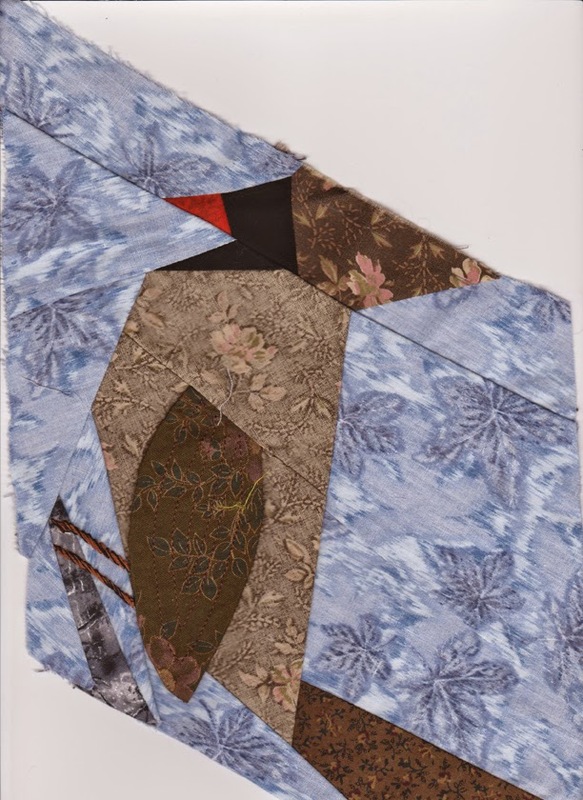 Since then, art quilt makers have explored the medium as a fine art, using dyes, paints, stitch, collage, digital printing, and mixed media to make work designed for the wall, not the bed. 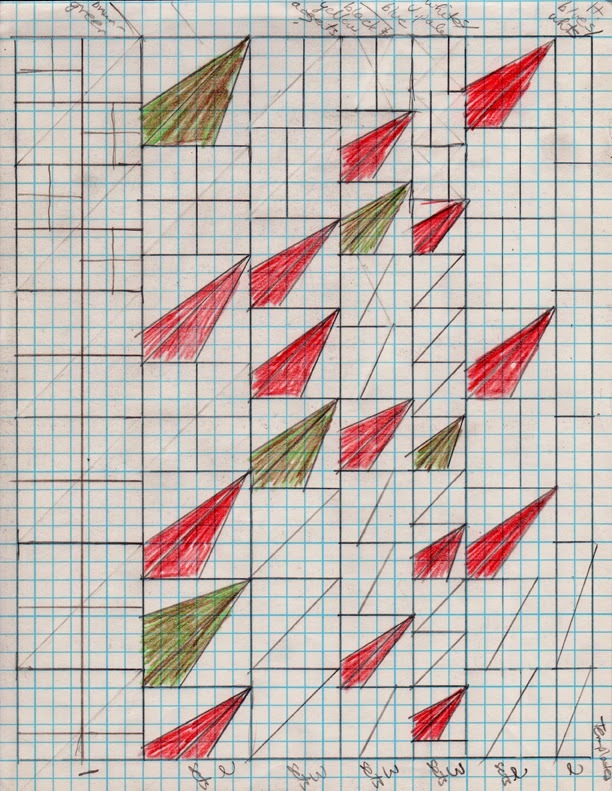 They have altered traditional block patterns significantly, or stopped using them altogether in order to design their own compositions. 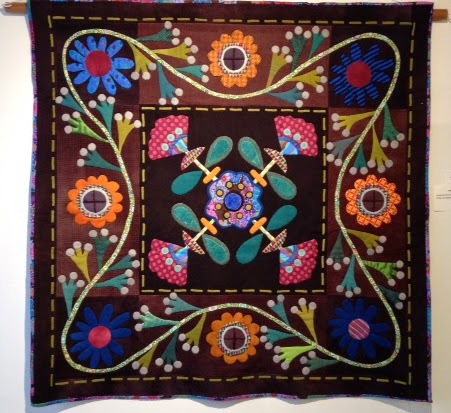 Quilt guilds encourage artists to learn together, often bringing in teachers and assigning "challenge" projects to develop members' skills. 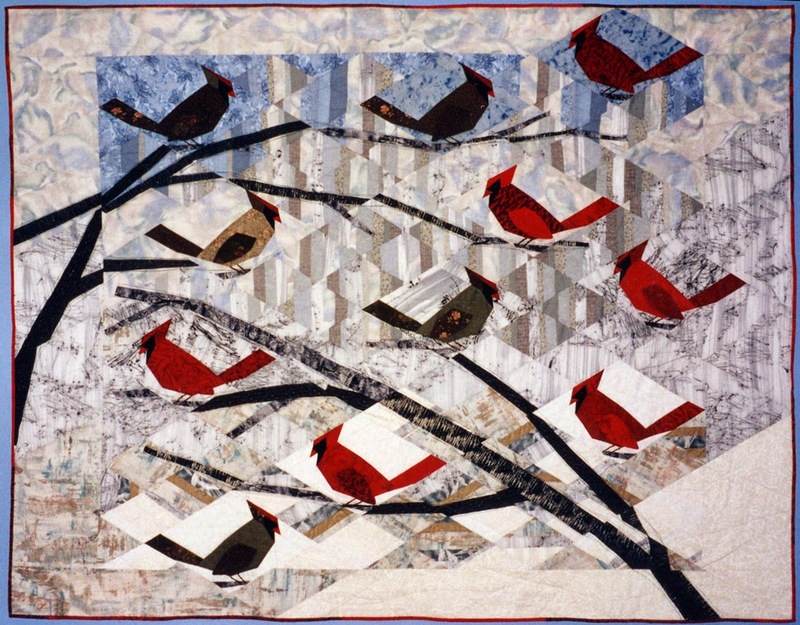 There are prestigious juried shows of art quilts, and gallery and museum shows of quilts regularly break attendance records. Today quilting is estimated to be a $3.58 billion business in the United States, and it is huge in Europe, Japan, and Australia. The effects of this movement are on view in the show in Canton, where many of the pieces reflect work done in guilds. The best-known maker in this show is Virginia Greaves, whose quilt Worn was inspired by a 1939 photograph by Dorothea Lange. It is a technical tour de force, a painstaking translation into fabric and thread of Lange's photograph of a farm woman. The details, values and shadows are handled so naturalistically that from across the room it is not clear whether you are looking at a painting or a quilt. The artist's statement and title refer to how the woman's weariness is reflected in the condition of her dwelling. 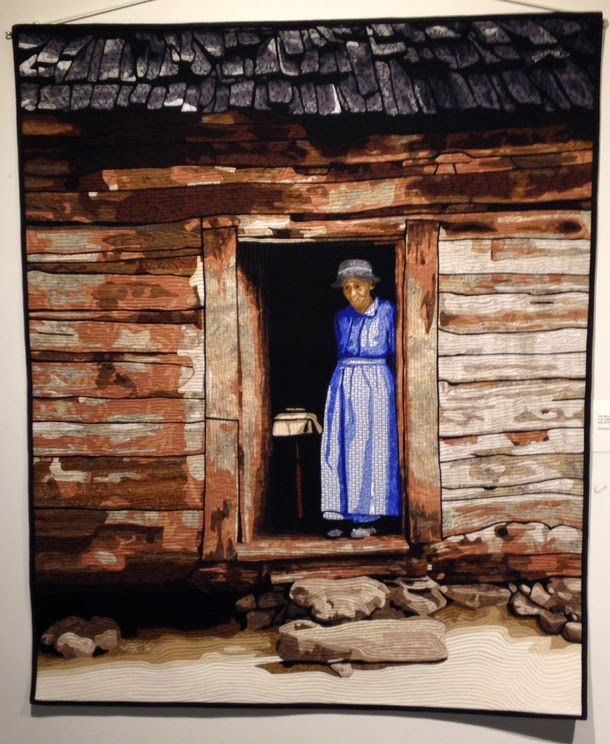 Greaves' work sparked controversy in the quilting world last year; apparently many quilters were offended by her use of Lange's (non-copyrighted) photographs as source material for her quilts (Greaves's quilt version of Lange's famous photograph of a migrant mother and her children won a prize at the 2014 International Quilt Festival in Houston). But artists have been borrowing from each other for centuries; using other works of art as inspiration is quite common in the wider art world. (I myself am working on a series in tapestry that is inspired by a specific ancient icon painting; see this post.) I would like to see Greaves interpret and transform her source photographs in a more personal way that expresses more of her own viewpoint. I look forward to the new work she is doing in collaboration with Leisa Rich that will be exhibited later this year. To return to the Canton show, if I had to sum up the show with one word, it would be Joy. These artists are having a ball exploring new techniques in their work. I especially enjoyed the work of Ann Quandee. She has an appealing loose approach, unafraid to let lines of stitch meander like drawn lines, revelling in free organic shapes, lush color, and contrasts of texture. 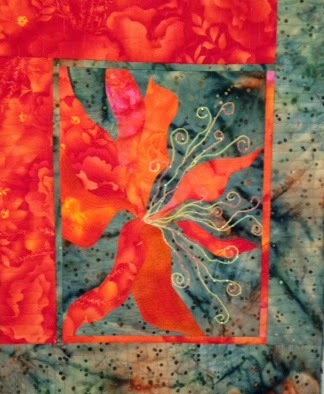 The quilt "Daylily" began as a doodle, we are told. 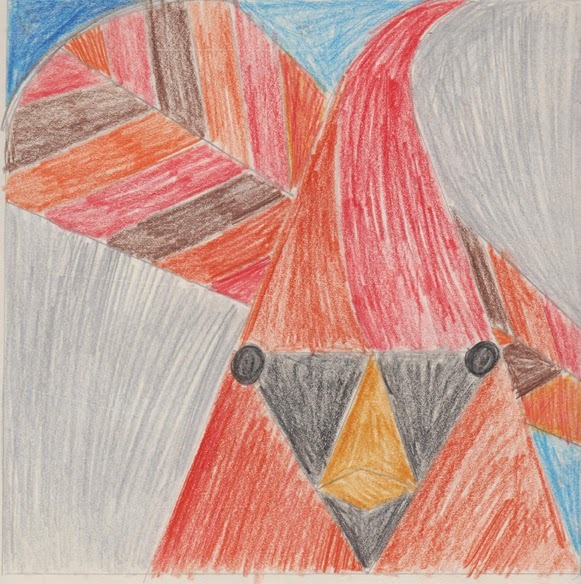 The work of mother and daughter Joyce Klein and Katie Klein also stood out for its playful exploration of color, texture, and composition. Not all work was two-dimensional. 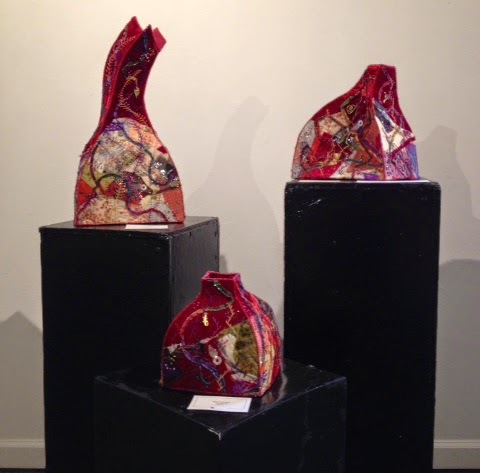 In three sculptural pieces, Crazy Patch Vessels, Patsy Eckman layered and pieced a variety of fabrics, linked them all with lines of complex embroidery, and attached small charms and buttons. 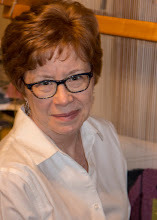 In conversation with Mary Akers, I learned that one goal of this show is to introduce folks in Canton and surrounding areas to the range of work being done in fiber arts today. In this show she has made an excellent beginning. P.S. 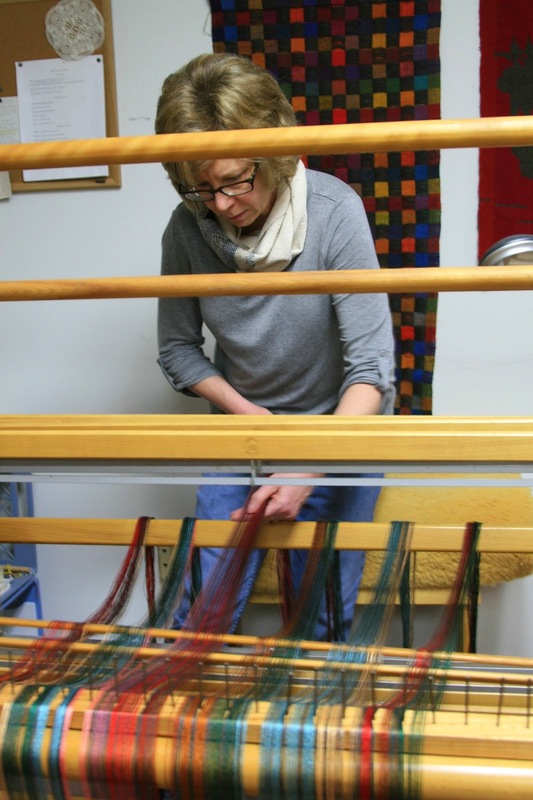 If you are interested in learning more about the process of designing your own original fiber work, check out this post about the workshop I'm offering at Southeast Fiber Forum, at Arrowmont craft school, in April.